Hi: Thanks for pointing this out. No, Experiencing Technical Difficulties is not a new show – though if you have any ideas you should pitch’em 😉 I suspect that this is showing up on Google because we were down for about 4-1/2 hours on Monday. It should disappear once Google crawls us again (hopefully today or tomorrow). While we’re on the subject of CBC.ca you might be interested to know that we had 3.94 million unique visitors in February. Here’s hoping your post will drive some more traffic. Thanks again for pointing this out. Jason MacDonald, CBC. That’s super funny! Does Google do that for every site that seems to be down? 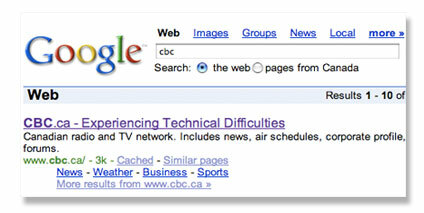 The way it looks, it almost looks like CBC’s motto. Something about it is so ironic; I love it. It’s doing it again, but this time it’s for real.